BEIJING, March 12 (Xinhua) -- Chinese judicial and procuratorial organs have maintained high pressure on law violations, ranging from graft, local mafia to "Peppa Pig" copyright infringement, to safeguard justice, social stability and development. The judiciary also endeavors to serve the country's all-round opening-up, the Belt and Road Initiative, and high-quality development, according to the work reports of the Supreme People's Court (SPC) and the Supreme People's Procuratorate (SPP) to the on-going annual national legislative session Tuesday. Chief Justice Zhou Qiang and Procurator-General Zhang Jun highlighted progress made in the past year when delivering the reports. 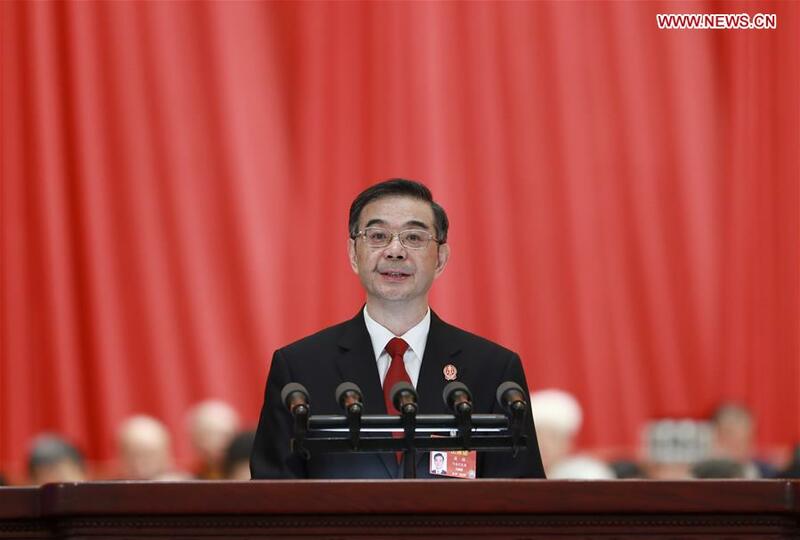 "The top court has punished crimes, protected the people, and resolutely safeguarded national security and social stability in accordance with law," Zhou said. The SPC handled 34,794 cases in 2018 and concluded 31,883 cases, up 22.1 percent and 23.5 percent year on year respectively. Local courts saw an increase of 8.8 percent and 10.6 percent in the cases they handled and concluded. Amid unwavering resolve to bring the corrupt to justice, Chinese courts concluded 28,000 graft cases involving embezzlement, bribery and dereliction of duty last year. Among the 33,000 people involved were 18 former officials at the provincial-level and above. Meanwhile, 32 such former high-ranking officials, including Sun Zhengcai and Wang Sanyun, were charged. Sun is former Party chief of southwest China's Chongqing municipality, who was sentenced to life in prison in May for taking bribes of over 170 million yuan (25.29 million U.S. dollars), while Wang, former Party chief of Gansu Province, stood trial in October, accused of using his position for bribe-taking. A total of 2,466 people who had offered bribes were convicted last year amid heavier crackdown on such crime. The courts also targeted corruption among their own ranking in 2018, with 1,064 court staff being investigated and punished for abusing the judging and enforcement power. Making headway in the campaign to combat organized crime and root out local mafia, Chinese courts concluded 5,489 related cases in 2018, which involved 29,000 criminals, while procuratorates across the country approved the arrest of 73,385 suspects involved in such crime, among whom 61,188 were indicted. Addressing pollution, China prosecuted 42,195 people for damaging environment and resources last year, up 21 percent year on year, and the courts concluded 2,204 cases involving crimes of environmental pollution. Strengthening intellectual property protection, Chinese courts concluded 288,000 cases related to intellectual property rights (IPR) of first instance in 2018, marking a year-on-year increase of 41.8 percent. Meanwhile, 8,325 people were prosecuted for criminal acts such as infringement of patent rights and trademark rights, up by 16.3 percent. In addition, the judiciary improved legal service of China's all-round opening-up. The courts concluded 15,000 foreign-related civil and commercial cases of first instance in 2018. Among the cases was one handled by the Hangzhou Internet Court, which adjudicated in last August a copyright infringement case and ordered two offending Chinese companies to compensate for the economic loss of British animation "Peppa Pig" character's copyright owners.